"Oh wow, how gorgeous! I would give the other to my mum (I know I'm supposed to say my husband, but he's already hit the maximum level of jewellery he'll ever wear!!) with my dad's handwriting in it. My dad wasn't a romantic at all, and often forgot her birthday and Valentine's Day. One year he went all out for Valentine's Day - present, card, dinner, the works. Two days later he died suddenly. She still has the card, and I'd get his written message put inside the love band." You know that feeling you get when you watch one your precious friends do something so incredibly amazing that you want to squeeze them to bits and tell them just how proud of them you are whilst singing their praise from the roof tops.... yep that! My absolutely gorgeous friend Kate of Uberkate has just launched her new Your Script technology AND a new blog and website all in the one week. How she and her hubby and business partner Adam are still standing after all the work that went into it, I truly do not know. But I am so proud of them.. so DAMN proud. The story behind Your Script literally gives me absolute goosebumps. It's movie material stuff, I kid you not. Imagine if your hubby proposed to you as he swanned through a restaurant, guitar in hand, singing you a love song called “Take My Name”... that he actually wrote for you! 11 years later on their anniversary, he presents her with an Uberkate Jewellery box. Luckily she restrained herself from punching him for giving her a piece of her own jewellery as a wedding anniversary gift, because, when she opened the box, she found inside a hand formed silver cuff with the lyrics from the song he wrote for her embedded into the metal. Even better, the lyrics were written in his very own handwriting. If this couple weren't so incredibly genuine, kind, generous and every kind of amazing... you could be forgiven for wanting to poke them in the eyes for being such a loved up couple. But you can't, poke them that is, because I would be forced to poke you back for they truly are the real deal and two of the most gorgeous souls you could ever hope to meet. Kate was so blown away by the incredible gift from her hubby that she dreamt about being able to share this gift with everyone in some way. 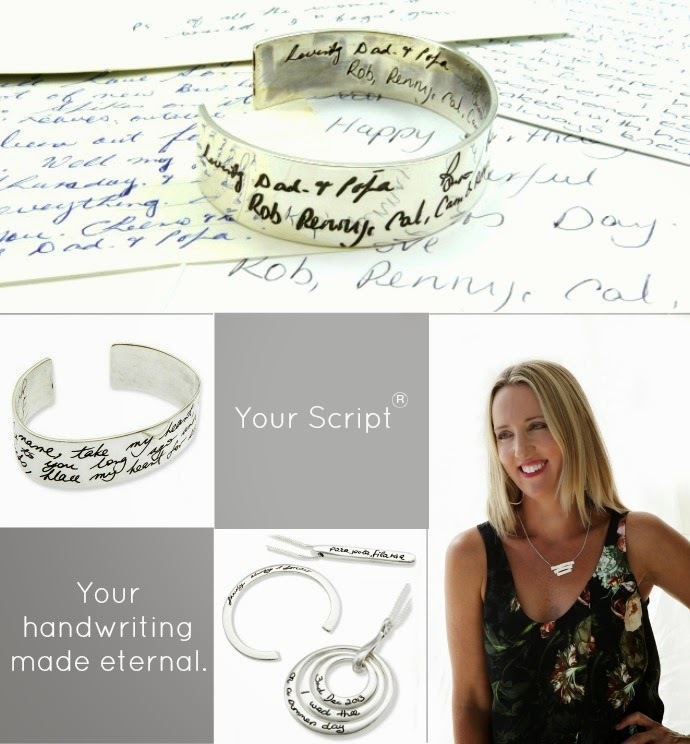 Kate's dream is now a reality, as Uberkate has combined an age old concept with cutting edge technology to deeply engrave your personal handwriting or the handwriting of a loved one, into all of their jewellery designs. 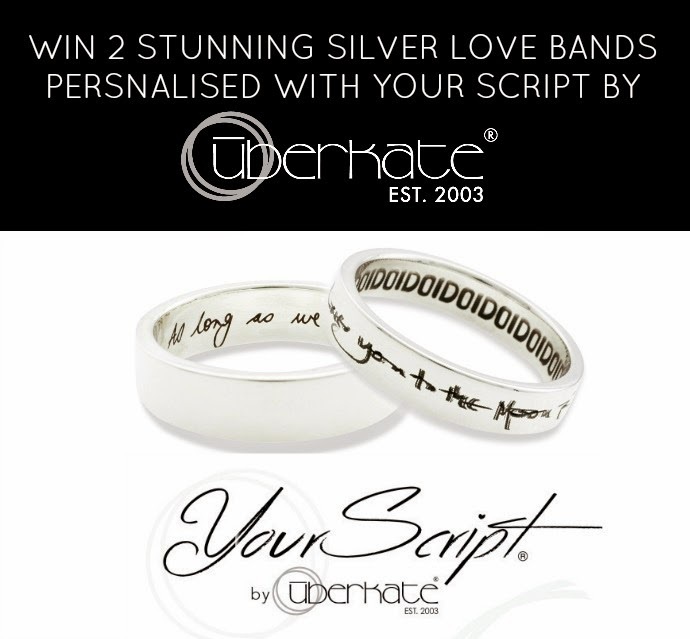 You can visit the brand new Uberkate website to view the full range of Uberkate Jewellery available and organise your own beautiful Your Script piece. 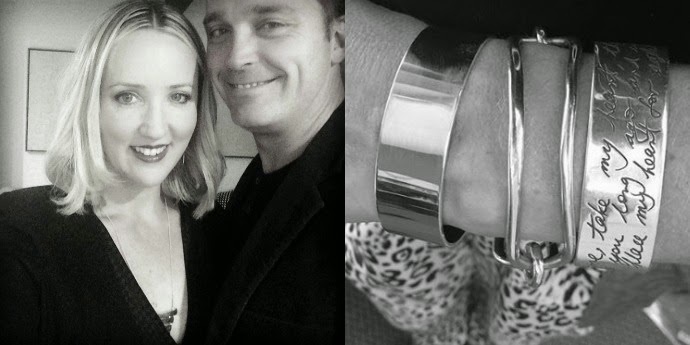 But before you dive into their awesome website, hang around a little longer because I am so thrilled to tell you that Kate and Adam would love one of you guys to win a set of stunning silver Love Bands personalised with your handwriting or the handwriting of a loved one. I know right! Probably the best giveaway I have ever had the privilege of running. Who would you give the other love band to and what would you have engraved on them? Then follow the prompts in the Rafflecopter widget below and cross all your fingers and toes and hope you are the winner. Join Us For Dinner At My Place and WinWin A Kip & Co Queen Size Quilt Set From AdairsTugging At The LeashUsing PicMonkey To Improve Your ImagesThe Great Paint DebateI Sorta Kinda LiedHalloween Party At My PlaceWeekend Rewind - Don't Be Shy!